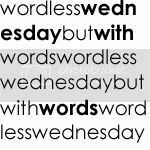 Project Alicia : Wordless Wednesday: Seeing Yellow? Canon 50D, Tamron 60mm f/2, Photoshop Elements 7, Florabella "Jane" Action used. Just a couple quick notes. If you do not know me well you may want to stop by Scraps and Scribbles. I am being featured over there today. And Courtney (from Scraps and Scribbles) with be visiting here tomorrow. Also, my blog may be down for a couple days starting Thursday evening for some maintenance. Don't miss me too much. That's such an amazing capture of the fly! Awesome. Another set of fabulous photos!! i love the little drops of water. wow that last shot is great, amazing detail! You make flys look pretty!!! The last one took me by surprise. A little to close for comfort for this blogger. Beautiful though. Thankfully with our cold weather the bugs are still in hibernation.... but then again so are the flowers. The fly one was too close for comfort for me too, BUT your skills are breathtaking! 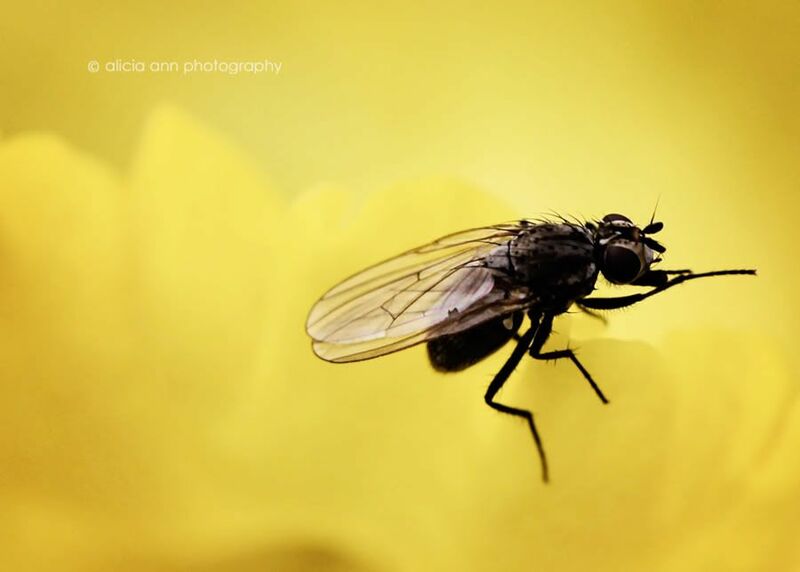 Beautiful photo's of the daffodil, and amazing capture of the fly. 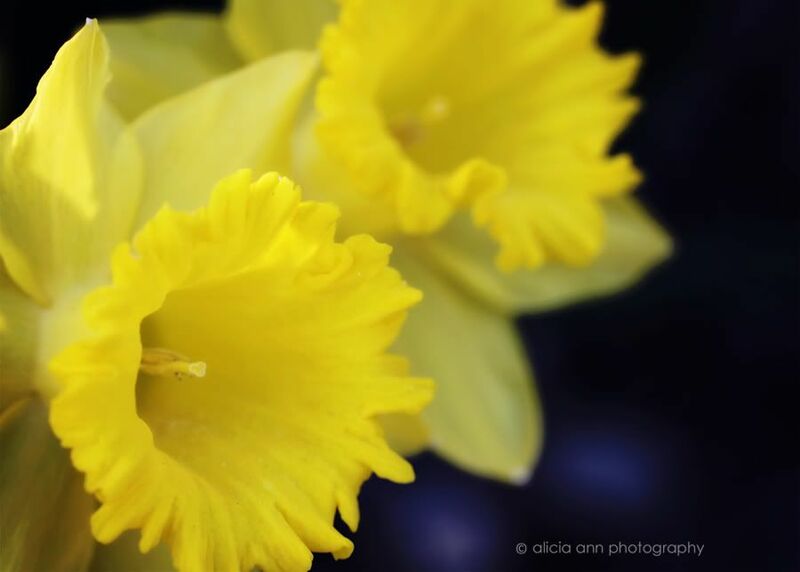 Is there anything more beautiful than daffodils in the Spring? Love the show with dew drops. How beautiful!! I love yellow! Seriously. Your photos are amazing. Amazing! 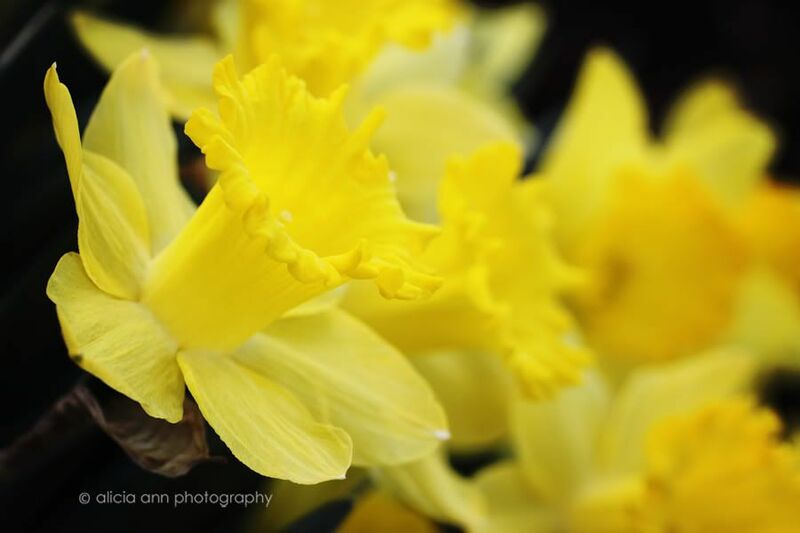 beautiful daffodils! I hope mine bloom this year. Insects closeups always make me happy that we are so much bigger then they are!!! These are awesome! Love the bugs and the water droplets! These are all great but that last capture is incredible. 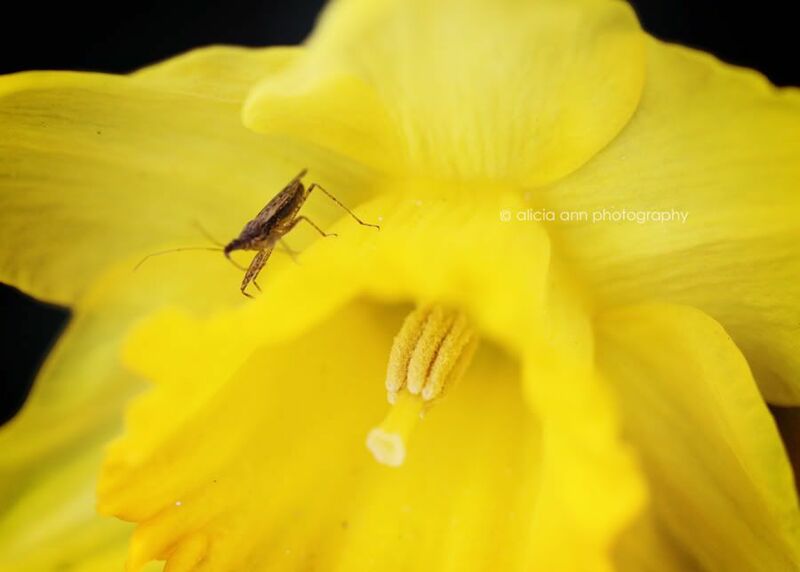 Stunning daffodil photos and that fly is amazing! Sorry my image is my Twitter follow. I did a video not a photo and I wasn't even given the option of my button...but lots of other ones including yours. LOL That is so awesome! WishI had a lens that would let me get that close! Gorgeous!! Man I've missed WW. Yes, we are seeing yellow here, finally! Oh Spring! How I miss the sun. Lovely bright yellow makes me think of our summers here in Seattle when the weather is just perfect. So pretty, I love yellow flowers! Ooh! Very pretty!!! How did you manage to get a close up of a fly??? It's pouring here, and the forecast doesn't look like that is going to change. These yellow pics are a perfect "pick me up." Thanks, doll! Great series - I love the detail and the different layers of focus. That last one with the fly is very impressive. 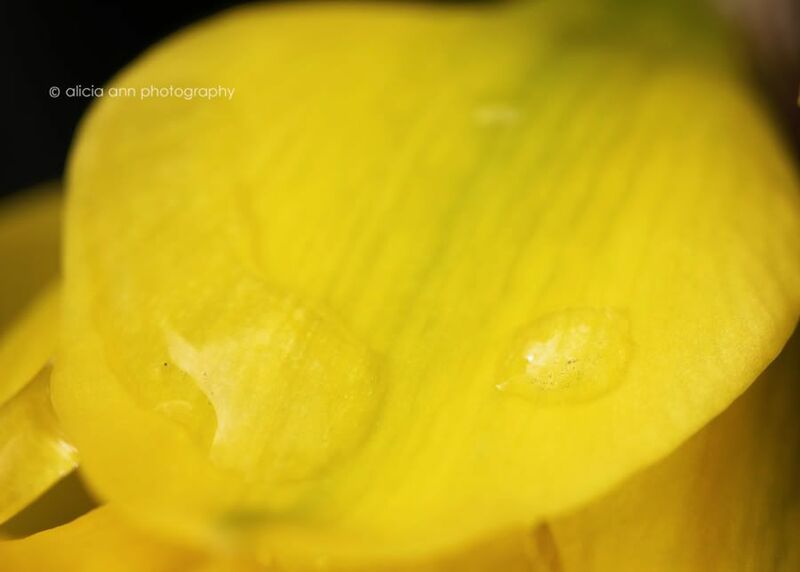 Just loving these gorgeous yellow photos! It really feels vibrant and springy all at once! Oh oh oh! I love these. Absolutely stunning! As my daughters would say, it's yellowicious. I love the beautiful tones you have achieved in these flowers, exquisite, deliciously attractive. Really beautiful. Congratulations and thank us happy on this beautiful way. Greetings. Gorgeous photos!!! Love them all. Absolutely gorgeous shots! Happy WW. Great shots and love how the yellow stands out! I love them all but that last shot is amazing. Wow...those are fabulous photos! Great detail! Wow! These photos are so beautiful! You should work as an photographer! Gorgeous photo. That shot of the fly is amazing. That fly is incredible! Wow! Love the yellow, just gorgeous! WOW! These are stunning! Gorgeous captures! Wow! So great detail. Beautiful! Hello, I live in CR too! Found you from Leovi's blog. I used to live somewhere else and now I am back in Iowa. Funny isn't it how that is a common Iowa story! Oh that last shot of the bee is just amazing! (they all are but that one is like National Geographic closeness). Gorgeous as usual! Wish it were not pouring here for the last week so I could go outside and snap some shots of my dudes in the sun. I think I'll get to work on my arch instead! I'm so jealous of how beautiful and springlike these pictures are that I want to cry. Thanks for bringing a bit of spring into my world. It was much needed!!! that fly is amazing. GROSS, but amazing nonetheless! 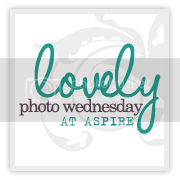 Your photos never cease to amaze me! Love, love, love your style! You inspire me to look more closely. Wish you could teach me how to take up closeups of nature. Beautiful shots. Thanks for stopping by my WW post. I just love that last photo! The fly is perfectly focused. Thanks for sharing. The last one is awesome! so beautiful! amazing detail and they look like they're lit from within. magical!